As the winter winds down, and the inevitable question comes, “What do you think? When will we be open?” My typical response is, “about April 15th.” Sometimes it's earlier, sometimes later–it won’t be earlier this year. Given the slow melt and the fact next week will essentially be a pause button, you won’t have to decide between watching the Masters, or playing golf. On the positive side, the course looks great! I don’t anticipate any winter damage. While coming out of winter clean has become a regular occurrence, this is no accident. 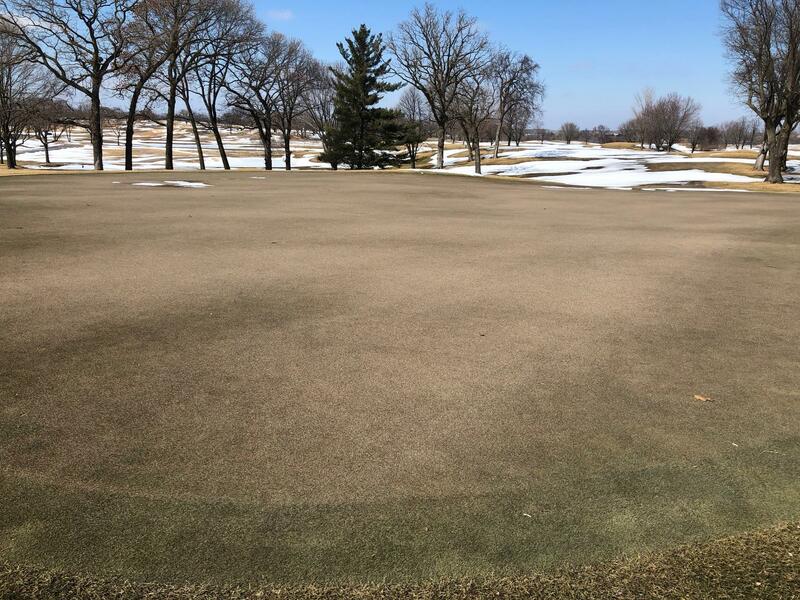 Preparing the course in the fall, paying attention with occasional intervention during the winter, and of course having bentgrass are all vital to insuring we start the season in great shape. The beginning of the winter was quite cold, with little to no snow cover. Due to this fact, the turf retained very little color, and thus as it emerges from the snow cover, appears quite brown. This is completely normal and green up will come quickly as soon as the weather warms. 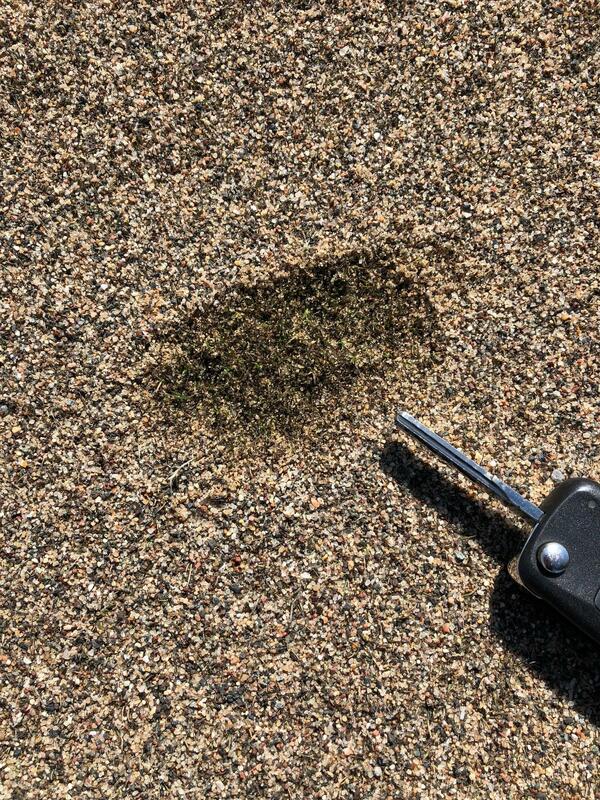 Prior to winter, the greens are covered with a significant amount of sand; this sand serves as a layer of protection during the winter months. This winter such protection was especially important due to the early deep-freeze. The drawback of this is the greens will be quite sandy as the course opens for play. This is not abnormal. How long the surfaces persist in this “sandy” state will be dependent on when and how much the weather warms. Rest assured, the performance of the putting surfaces will be excellent. Early in the winter, the turfgrass staff removed 30 ash trees from the golf course. These removals are a proactive reaction to the imminent arrival of the emerald ash borer (EAB). The 30 trees removed were not impactful to play, and thus were not being treated against EAB. In other areas of the golf course, Vineland Tree Care performed maintenance pruning on several of our beautiful hardwood trees. Keeping this population healthy means a different area of the course will be focused on each winter. Golfers are often surprised at the length of time it takes to mow our rough. With one large mower and two smaller mowers, the rough takes most of three full work days to be completely mowed. Last year we acquired a new large rough mower. Rather than trade the old unit, it was kept for times when we needed to catch up on mowing following significant amounts of rain, or a big outside event. When both mowers are used, the large areas of rough can be mowed in just over one day. It’s easy enough to say, “cut the rough more often” but doing so requires equipment and manpower expenditures. Saying is easy, doing requires a bit more planning and resources. In the past, a typical mowing schedule was to mow the entire rough once, starting on Monday. If conditions allowed, we would then make two or three laps around each fairway at the end of the week. In aggregating the comments over the years, there’s no doubt mowing the rough twice per week is enjoyed by golfers and leads to a more consistent appearance. All primary rough will be mowed 2x per week, so long as weather allows. Once at the beginning of the week, once nearer the end of the week. The height of the rough will not change. As noted above, when the rough is mowed more frequently, players feel good about the height. There will be times when the weather, time of year or event schedule interrupt our routine and keep us from fulfilling the plan. Following the informative and successful town hall meeting on December 19th, 2017, construction on the new and improved black tees will begin as soon as the weather allows. Construction will proceed in as timely a manner as the weather allows. As tees are put under construction, the necessary tee markers will be moved forward to the nearest area of flat fairway turf. This work will be minimally disruptive, and the tees put back into play as soon as possible. I won’t make a prediction as to when all tees will be in play, but as the project moves forward, timely updates will be provided. Most of the tees will be located very close to their current location with the biggest change coming on the 12th hole. On the 12th hole, both the white and the black tees will be moved in from their current location, such that all teeing grounds on the 12th hole will be in a single line. As many of you will know, I’m a consistent user of social media. I’ve used Twitter for many years. This year I’ll be adding an Instagram account dedicated to the work on the course. The username for this account is the same as my Twitter account; @ct_turf. I hope you’ll follow, because I know you’ll enjoy it. Should you have any questions or comments, please feel free to reach out. Next time I’ll be covering some of the winter projects and staff additions.